The Pen15 Club breaks the saddest (if most predictable) news I have heard all week. 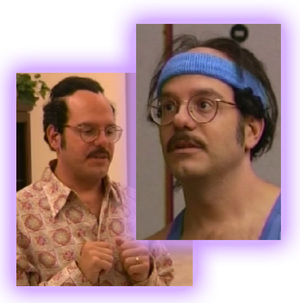 Which is why last night was so great: not one, but two new episodes back-to-back, which meant double the amount of the fey, feckless Tobias Fünke, and twice his regular number of ridiculous attempts at an actual hairstyle. As always, Tobias was caught in several double entendre holes of his own digging. In the first episode, he coaches the painfully plain Ann Veal for an "inner beauty" pageant. And in the second, he becomes a "mole," with cataclysmically comedic results. And as a bonus, Malco-Vision is including a scene in which George Sr. is led to believe he is going to speak to young men at a "Startled Straight" meeting on the perils of prison life. Which, of course, backfires. Like any good gay, I read my Out magazine every month, including the monthly missive by editor Brendan Lemon. 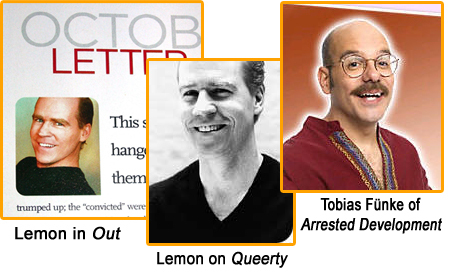 But the picture of Lemon in his columns is composed rather strangely, and I didn't think much of it – until I noticed the same odd cropping in another photo in a profile of Lemon over on Queerty. C'mon, Brendan, let it shine! Tara Reid wants to know: "Why is partying and having a good time bad?" Umm, could this be why? Arrested: New Lease on Life? The Oscar winner has signed on for a five-episode arc in which she plays a British love interest of Michael Bluth's. On Sunday, Sept. 18, the Emmy Awards will air, one night before the season premiere of Fox's Arrested Development. I have given it some thought -- probably more than I should -- to why Arrested Development deserves to win, hands down, the Emmy for Best Comedy. Again. Of course, none of this is reflected in AD's mediocre ratings, but Fox's continued confidence that this will change gives me reason to hope. It all hit me when I was watching one of the episodes from season two, which Fox has been re-running four per week on successive Fridays this summer. My thesis can probably be summed up in one 40-second clip featuring the three Bluth brothers (Jason Bateman, Will Arnett and Tony Hale) and their lawyer, Barry Zuckerkorn (Henry Winkler). There is nothing fall-down funny about it, but it represents AD's respect for its audience and its (yes) subtle humor. Consider it sort of a comedy IQ test: If you laugh, then you're either a current or prospective Arrested devotee like me. If you don't, then please watch anyway so that it stays on the air for the rest of us.